While 2012 was disappointing in terms of growth of the commercial property sector, it is thought that 2013 looks to be more promising. However, London's commercial property development relies heavily upon any further job loses which may occur. Thus far, the financial sector of London is showing 24% fewer job vacancies than December 2012. It is believed that the development market in London will remain relatively stable throughout 2013. Savills UK commercial research department predict that an increase of 3% in the rental sector is expected, while commercial developments are also thought to be on the rise, mainly due to growth in London's technology and media telecommunications sectors (TMT). With this growth come further tenants looking to both rent and buy offices and other commercial properties. However, before this increase can be fully realised, it is predicted that the market will bottom out: a prospect, according to partner and head of real estate research in Deloitte Real Estate Anthony Duggan, which could be thought 'heroic'. So far, January has only shown a decrease in rental and commercial properties, with a decline of 0.1% compared to December 2012. But after flattening out at an all-time low since the high of 2007, things should only increase, in terms of both investment sizes and market prices. 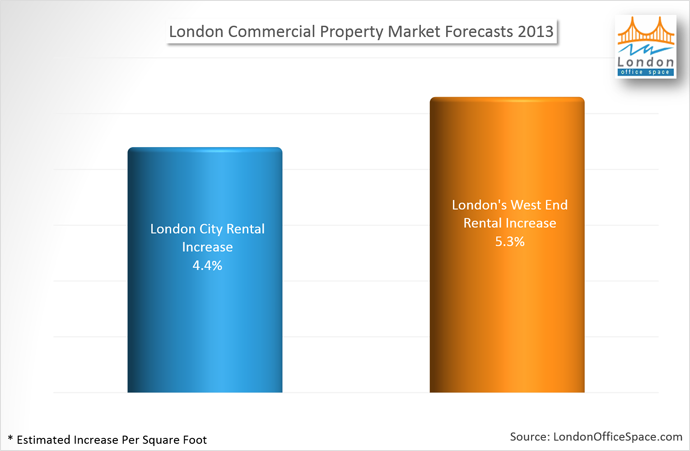 In general, the commercial property market enters 2013 with far more confidence than previous years. This optimism from investors and developers should be seen later on in the year in terms of renewed growth and investment. For instance, it is expected that rent prices in London City will increase by 4.4% per square foot, with this rising to 5.3% in London's West End. These predictions come from Jones Loan LaSalle, global real estate firm. As previously mentioned, commercial property investment by such technological giants as Google and Liberty Mutual in London's TMT district has already assured a high of five years in the numbers of property deals completed. In 2012, technology and media telecommunications account for 22% of total take-up in London. This figure is expected only to grow, with an expected value of 30% in 2013. With technology and media sectors encompassing a huge 30% of office rental space in the city, pre-lettings in this section are believed to increase confidence in the economy as well as businesses. One section which has seen a lot of interest in developing properties is the education system. Higher university tuition fees and student loans has led to further pressure and expectations for top class facilities to be provided. Much of the development in this sector has been paid for out of public funds, though there are many private companies taking advantage of the increased demand also. As in past years, the level of foreign investment in London's commercial property continues to skyrocket. This is hardly a new trend, with London's prime property having beaten both New York and Paris in prices every year since 2009. London Central Portfolio, property managers who have delved into this matter, say that this is not like any housing bubble, which may burst at any moment, but has remained a stable place to invest. Increased competition in the purchase of office buildings in London's West End is predicted to give rise to higher rental prices as the area regains its claim of being the most expensive of all the office markets across the globe. As well as the obvious benefits this brings to office rentals, reclaiming this title makes London a 'must-have' spot for retailers, hotels and other industries. However, despite the increased confidence and growth in certain property-driven sectors, it is thought by some of the experts in the field that rental prices will increase by little compared to 2012: Knight Frank Research predicts an annual growth of 1%, while Savills believes 0 - 1% will be the maximum. In summary, though things are looking up for the commercial property development sector in 2013, it is not predicted to have any dramatic effect on the market for 2013: 'In sort, the next 12 months are unlikely to bring a dramatic turnaround,' says Jones Lang LaSalle's UK Chief Executive Guy Grainger, before going on to say how 2013 is most likely to provide the foundation for growth in further years.